← Dave & Buster’s Grand Opening Today in Cary Towne Center! A Visit to Historic Yates Mill Park in Raleigh! 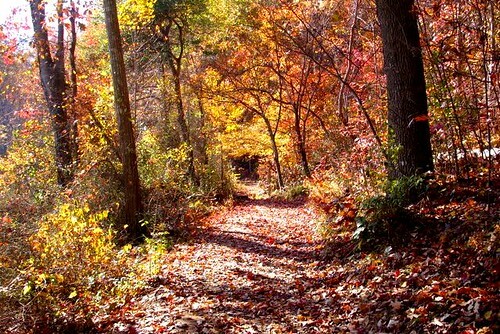 Yates Mill Park is one of my favorite places to visit in Raleigh each fall. I’ve made it a yearly tradition to walk through the park each November before Thanksgiving to take in the fall foliage before the colder winter weather arrives. 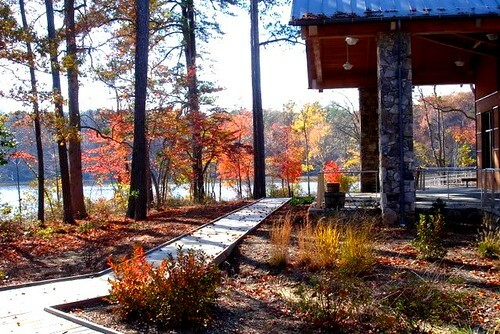 The park is located park that is located about 2 miles south of Tryon Road along Lake Wheeler Road. 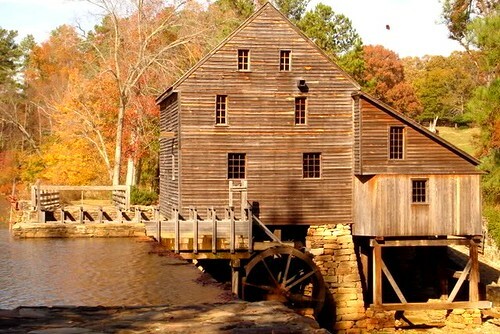 It is 174 acres and is home to a 20 acre pond, a wildlife refuge, environmental research center, and the only remaining working gristmill in Wake County which has been in operation since around 1756! Of course the highlight of the park is Yates Mill. It is the only remaining water-powered gristmill left in Wake County. The Mill is open for guided tours by appointment and during specific dates from March through November. They also hold corn grinding demonstrations with people dressed in period clothes on the third weekend of each month during the tour season. Reservations are encouraged and a small fee applies. See the park website for additional tour details and information. While the mill is the main attraction, I also enjoy taking a stroll around the pond on the nature walking trail. It provides great views of the pond with the mill in the background and you are surrounded by a multitude of vibrant leaf colors from the numerous trees along the trail. I typically head over to the park two or three weeks before Thanksgiving. The leaves are in perfect color right about now and it is nice to enjoy them while it is still somewhat warm! I haven’t taken the tour of the mill yet, but I discovered you can stop by the park visitor center where stone-ground cornmeal made at the mill is available for purchase everyday. The mill pond and surrounding natural area makes for great photo opportunities and is a favorite location for wedding pictures and family. It is important to note that the park has several rules to be aware of. In particular no pets (other than service animals) are allowed in the park and the trails are for walking, bikes are also not allowed. In addition to the mill and walking trails through the woods there are also a few boardwalks incorporated into the trails that provide access across sections of the pond. 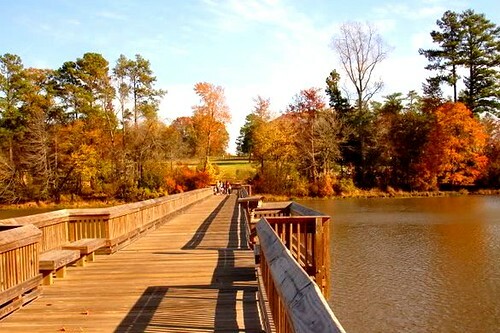 These boardwalks serve as great spots to do a little fishing with kids. 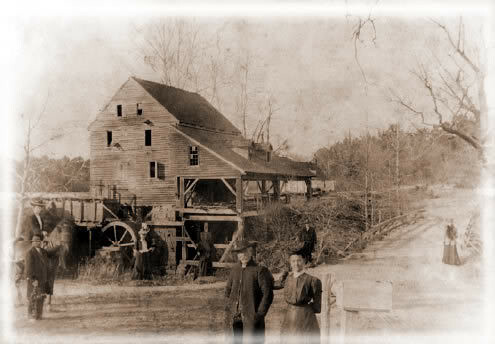 Undated photo of the Mill – courtesy of Wake County Parks Dept. Fall visits to Yates Mill Park have become an annual tradition for me and my wife. Later this month I’ll share some additional Triangle locations we enjoy visiting each year as the holidays approach! 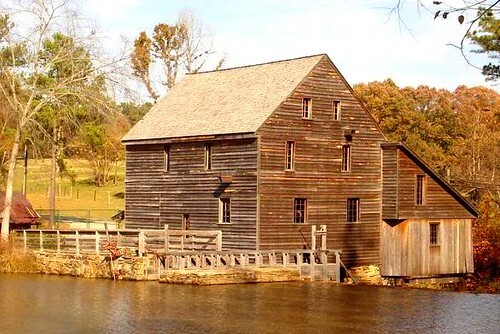 You can learn more about the long history of Yates Mill here on wikipedia. Open 7 days per week, 8 am to sunset. This is so close to my home. The kids and Will walked there the other day. Leigh, that is so great that such a wonderful park is within walking distance of your home. Yates Mill Park is such a gem!